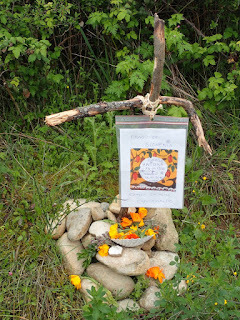 Every year a few pilgrims die whilst on the Camino. Some have heart attacks, others die of existing conditions, and many more are killed on the roads by vehicles. 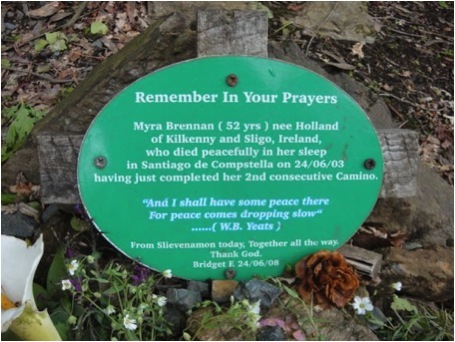 The numerous memorials erected by the loved ones of those who lost their lives on the Camino are a poignant reminder that with over 500 000 pilgrims on the Caminos each year, deaths will occur. mountains of El Bierzo Leon. April 16 to 17 in the municipal albergue in Burgos. Drago Žnidar (or Žnider) from Slovenia died of a heart attack in Lorca on 18 April. A middle aged pilgrim died 28 April as a result of a bicycle accident near Tricastella. 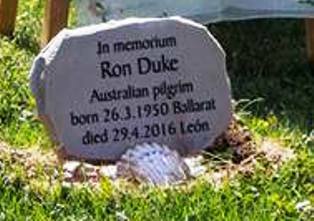 Ron Duke, 66 year-old Australian pilgrim, had a fatal heart attack while sleeping peacefully on 29th April 2016 in Leon, having walked with Shirley from St Jean Pied de Port. Shirley finished the pilgrimage for both of them and received two Compostelas in Santiago. A 71 year-old German pilgrim died on May 2, 2016 in the Pontevedra albergue of a heart attack. in the A Guarda shelter (Pontevedra), due to cardiac arrest. Orisson auberge on the first day of his pilgrimage. serious illness, died suddenly on June 20 in Burgos while resting. Camino Primitivo from Oviedo to Santiago. charity cycle trip to Santiago when he collapsed and died on 21 July in the Irago Mountains. Almaden de la Plata (Sevilla), from heat stroke. The body of Belgian pilgrim Jeroen Schelstraete was found in Leon 9 September. He died of wounds inflicted by unknown persons. Jim Ha Cho, 41 year-old South Korean, disappeared from the beach at Finisterre 12 September. His body has not yet been found. Patrick J. Ennis passed away in San Jose, Burgos on 15 September while walking the Camino de Santiago with a friend. 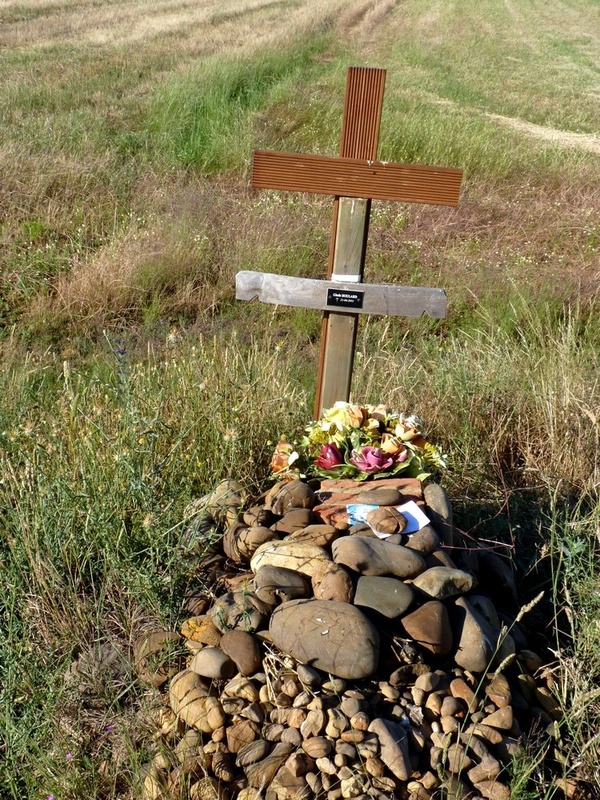 Denise Thiem, an American pilgrim who went missing in April near Astorga, was found murdered in September. Juan Carlos Lema Balsas 'Zapatones', pilgrim and Jacobean icon of the Compostela pilgrimage, 61 years old, died on May 14 in Pontevedra. 67 year-old pilgrim resident of Lugo died when she was hit on the N-547 on 7 June passing through the town of Arca in the Coruña municipality of O Pino. The body of Adrian Ruiz Munuera, a native of Fuenlabrada was found after he went missing two days earlier -22 October - having completed his pilgrimage in Finisterre. 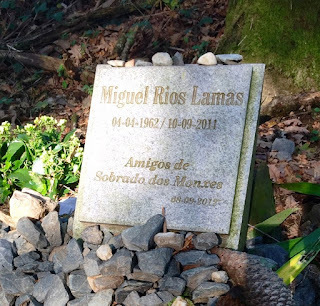 Miguel Martinez Maestre (55 years) and José Lillo Huertas, Alicante pilgrims traveling north to begin the Way in Villatobas (Toledo) died on April 26, 2014, when their van rolled down an embankment. Pilgrim British cyclist, 71 years old, died on September 1, 2014 in Carrion de los Condes (Palencia) of a heart attack. Vicenta Beltran Arnández, 55 yeasr-old pilgrim cyclist from Valencia died on September 5, 2014 at the hospital in Barakaldo (Vizcaya) of a stroke. Japanese Pilgrim, 52, was found dead on November 13, 2014 in a farm shed near San Juan de Ortega (Burgos). Jenaro Cebrián Franco, canon of the Cathedral of Santiago and director of the Pilgrim Office, 77 years old, died on January 1, 2012 in Santiago de Compostela victim of a heart attack. Rev. Philip Wren 'Methodist Pilgrim' died May 2013 in Palencia on The Way. 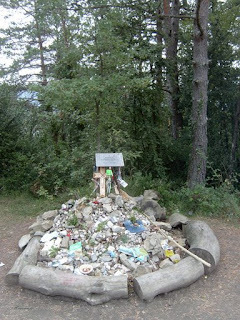 Dario Bandera , Italian pilgrim 65 years of age, was found dead on May 23, 2013 in the mountains of Nobla as close to Undués of Lerda (Zaragoza), victim of a stroke. Dr Agnel Lobo (60 years) died in Triacastella on the 3rd of October 2013 of a heart attack. Sebastien Thomas, French pilgrim coming from Mont Saint Michel, died on March 3, 2012 in the course of his pilgrimage. A 67 year old Italian cyclist died on April 24 in the vicinity of Fuente de Cantos (Badajoz), hit by a vehicle. Joan Ramon Caparros Segui , Barcelona pilgrim who started in Seville, died suddenly on May 10, 2012 on entry to Santiago de Compostela. Mark Byron Dennis, pilgrim of Michigan (USA), 53 years old, died on May 31 in the shelter of Burgos, in his sleep. A British pilgrim 66 years old, died suddenly on July 24 in Ponferrada, while walking on the Sil River Bridge. A pilgrim from Sabadell (Barcelona) , 64 years old, died suddenly on August 14 in the vicinity of Castaneda (Arzúa, La Coruña), due to a heart attack. 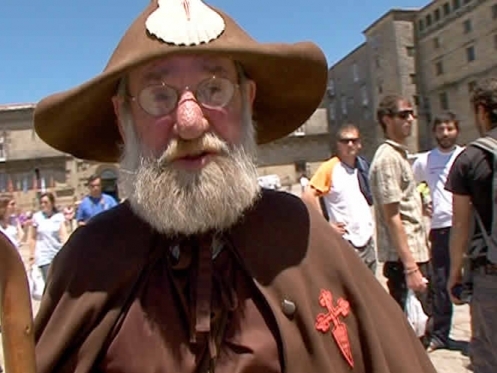 Eric Rudolf Selman , Dutch pilgrim coming from Oviedo, died on September 26, 2012 in Arzúa (La Coruña). A 65 year old pilgrim Tarragona Ourense resident, died on September 11 in the vicinity of Lalin (Pontevedra), hit by a vehicle. A 25 year old Belgian pilgrim was found dead on the morning of October 24, 2012 at the viewpoint of Monte del Gozo Santiago de Compostela. Pater Georg, Bremen German pilgrim who walked the Camino de Santiago to Compostela from Porto, 68, died the day after his arrival in a pension in Santiago on April 7, 2011. Angel Perez Salinas, Navarra pilgrim who came on foot from Saint Jean Pied de Port, died on April 24, 2011 unexpectedly in Palas de Rey. Johanna Chmiel, Austrian pilgrim, died on May 10, 2011 without being able to complete the Camino in Santiago. Skov Arne Schmidt, Danish pilgrim 76, died of a heart attack about 100m after the passing ancient the Roman Bridge before Lorca. 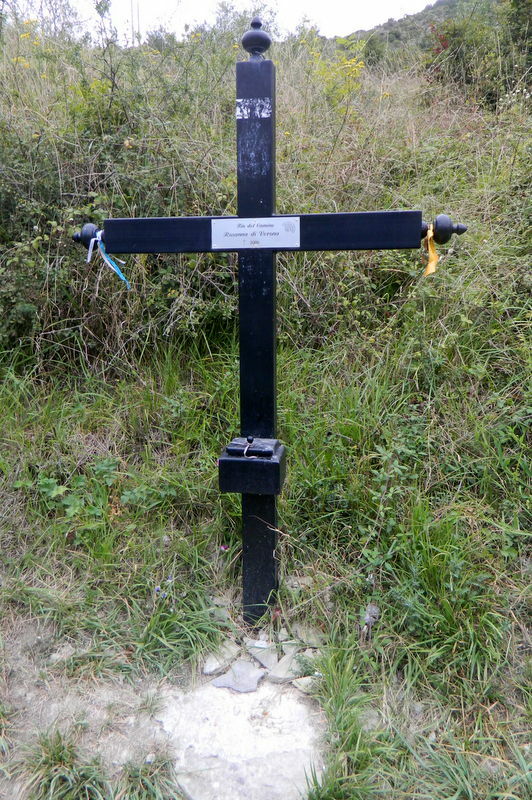 In 2012 his widow and family members erected this iron cross in his memory. Nicole Bigo, a pilgrim from France who began in Le Puy en Velay, died before reaching Santiago. Herceg-Peterdi Reka, Hungarian pilgrim walking from Saint Jean Pied de Port died in Leon. Cornelius Bernardus Ignatius – a winter, a pilgrim from Holland, died on September 7, 2011 in Ponferrada. Franciscus Johannes Maria van Everardus Gijzel, Dutch cyclist pilgrim coming from the shrine of Santiago de Galder (Netherlands) died on October 12, 2011. Constantine Ferrandis Campins , Mallorca pilgrim died unexpectedly before starting his pilgrimage, his teammates made the pilgrimage on his behalf and arrived in Santiago on October 18, 2011. Maria del Pilar Hernandez Garnes, Castellón pilgrim began in Roncesvalles and reached Logroño where she became ill and died shortly afterwards. Anters Steffen , German pilgrim, 26, died on January 17, 2010 after being struck by a train near Sergude (La Coruna), between Vedra and Susanna, a few kilometers from Compostela. Juan Bautista Prats i Catala 68, died of a heart attack in the night of 28 to 29 April 2010 while he slept in the village of Hontanas (Burgos). Linus Gillis, 62 year old Canadian pilgrim started in Saint Jean Pied de Port, died on May 17, 2010 in Terradillos of the Templars (Palencia). Christiaan Adrianus Van Gol Jacqueline - 71 years old Dutch pilgrim making the journey by bicycle from his country, died on May 22, 2010 in Leon victim of cardiac arrest. An Italian pilgrim, 31 years old, died on July 9, 2010 when he mounted Ibañeta (Navarra), due to heat stroke. Carmelo Arnaiz Chaton, Spanish pilgrim, 68, died July 9 at the hostel of Avilés (Asturias) in his sleep of a heart attack. 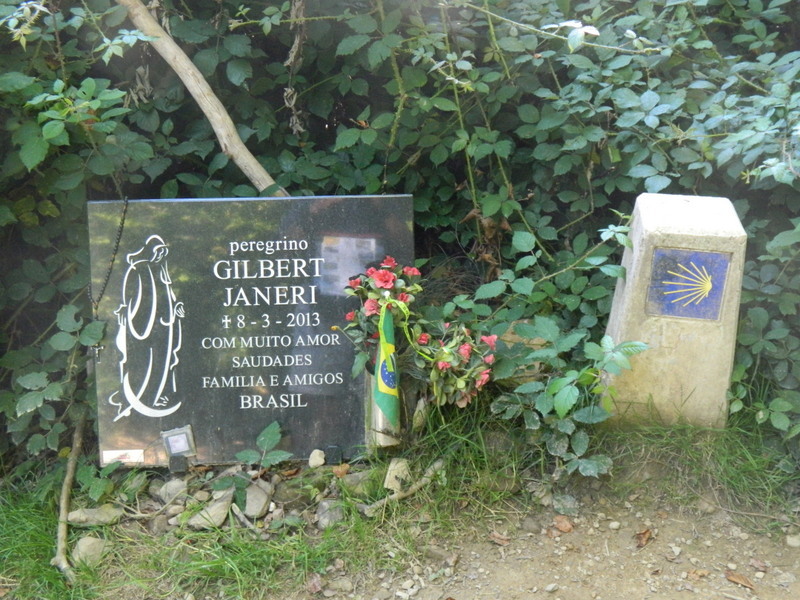 Guilio Recusani, Italian pilgrim, aged 26, drowned on August 20, 2010 in Finisterre, after completing the pilgrimage to Compostela and continuing to Finisterre. George Kollen, German pilgrim, 67 years old, died on the morning of October 16, 2010 between Portomarín and Sarria (Lugo), of a heart attack. Lucio Cardillo, Italian pilgrim, 70, died on May 26, 2009 in Burgos. His family continued the pilgrimage on his behalf. Pedro Fernandez Fernandez, a veteran pilgrim and hospitalero, 60, who had to stop in May in the shelter of Samos when he fell ill and died on June 22, 2009 at a hospital in Leon. Mönnigmann Josef Werner, German pilgrim Sassenberg, 60, died of a heart attack on September 9, 2009 in the shelter of Azofra (La Rioja). Efferen Werner, German pilgrim died on September 13, 2009 in Foncebadón (Leon). 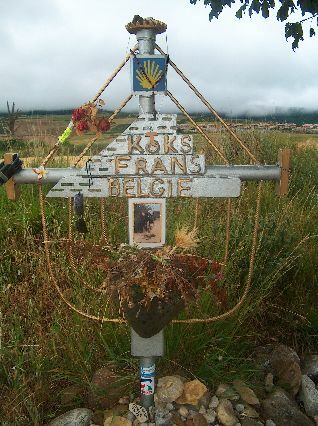 Alfons, Belgian pilgrim died of a heart attack on September 29, 2009 in the shelter of Mansilla de las Mulas (León). Romain Floener, pilgrim from Luxembourg died in late September 2009 in Porriño (Pontevedra). AG, Limoges French pilgrim, 60, died on May 6, 2008 near Mañeru (Navarra), of a heart attack. Rodrigo Grossi, pilgrim veteran and President of Astur-Leonese Association of Friends of the Camino de Santiago (Oviedo), 74, died on May 18, 2008 near Tarrueza (Cantabria) of a heart attack while on North Road with their Association. Paul Anthon Wharsop, pilgrim English cyclist, 60, died on May 30, 2008 between Valcarlos and the Ibañeta Pass (Navarra), of a heart attack. Home Thomas Huete, Cuenca veteran pilgrim, 61, who was about to start in mid-July 2008 a new journey in Leon, when he died of a heart attack. Francisco Javier Burgos Lizaldez , pilgrim of Zaragoza, 53, died on September 10, 2008 near Sangüesa (Navarra), of a heart attack. 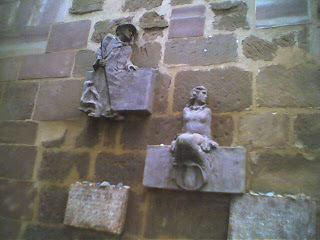 Efferen Werner, German pilgrim died on September 13, 2008 in Foncebadón (Leon). Jose Manuel Caudet Peris, a pilgrim of Valencia, 57, died of a heart attack on September 15, 2008 at the Cathedral of Santiago, as he climbed the steps to embrace the Saint. Francisco Manuel Lopez Picasso, Malaga veteran pilgrim, 42, died on September 25, 2008 as he climbed the hill Mostelares. Manuel Rodríguez Viña, pilgrim and hospitalero of Zaragoza, 55 years, while serving as a hospitalero in Arrés (Huesca) had to be rushed to hospital in Huesca, where he died on the night of 20 to 21 October 2008 of meningitis. Chris Phillips 51 - Scottish pilgrim left Saint Jean Pied de Port for Roncesvalles but did not arrive because of the snow. He was found the following day April 4, 2007 just 50m from the road and taken to a hospital in Pamplona, where he died of hypothermia. Jean Bernard Andre Gros, 65 French pilgrim who walked the road with his wife, died on the afternoon of May 14, 2007 in Palas de Rei (Lugo), while resting at a hotel. Kelly Tomas Murillo, a pilgrim of Costa Rica 61 years old, walked with his sister from Saint Jean Pied de Port, but died in May 2007 of a heart attack. Marcia Schiavon, Brazillian pilgrim passed 21th June 2007, in Boadilla del Camino, from heart attack in her sleep. Gonzalo Bañolas Bolaños 46 – from Canary, died on June 26, 2007 in Burgos where he was about to start walking the Camino de Santiago. 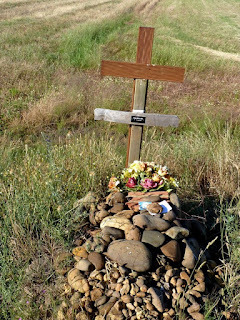 Jesus Sanchez, pilgrim rider from Vitoria (Alava) who did the Camino with his son, was hit by a car on July 28, 2007 and died on 31 at a hospital in Orense. Andrés García Pelayo, pilgrim rider Algeciras (Cádiz), 41, died on September 5, 2007 after fainting while climbing to Cebreiro. James Niergang , French pilgrim 63, died on the night of 15 to 16 October 2007 at the hostel of Nájera (La Rioja) in his sleep. Torremocha Carlos Lorenzo, 63 year old pilgrim and hospitalero veteran died on January 8, 2006 in Tres Cantos (Madrid) of a heart attack - just 15 kilometres after starting the road from his home in Madrid. Christine Gall, French pilgrim who died after starting her pilgrimage to Saint Jean Pied de Port. Vanhersecke Claude, French pilgrim died after starting his pilgrimage in Le Puy. 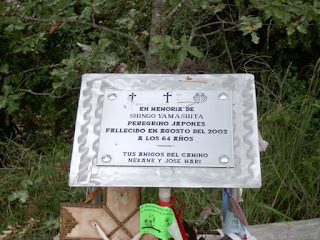 Santino Joseph Campo and Julian Manzano , 50 and 51, both friends and hospitaleros were killed on August 21, 2006 in Villada (Palencia) in a train accident , returning home from a pilgrimage to Santiago on the Camino Portuguese. Higinio Aguado, Spanish pilgrim of 67 years of age, died on September 8 in Villafranca Montes de Oca (Burgos) after suffering a fainting spell. 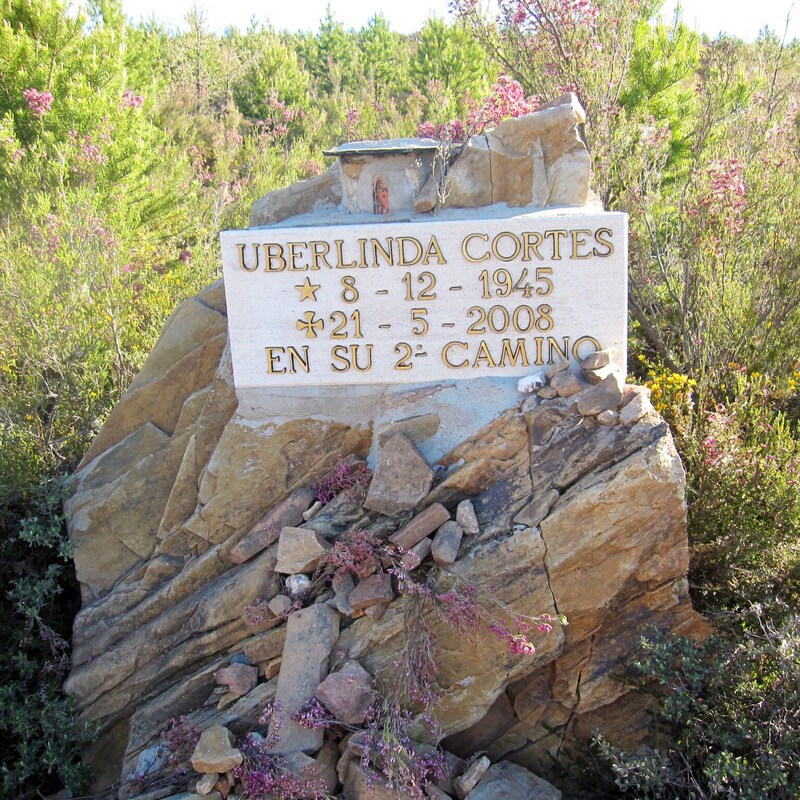 A Pilgrim, 62 years old, died on September 9, 2006 after Castrogeriz (Burgos) as he climbed the height of Mostelares. Rosa Maria Seia Amorim, a Portuguese pilgrim cyclist from Barcelos (Portugal), died on September 29, 2006 during the course of the last stage and close to Santiago. Francis Marsac , French pilgrim who came from Le Puy, died on May 16, 2005. 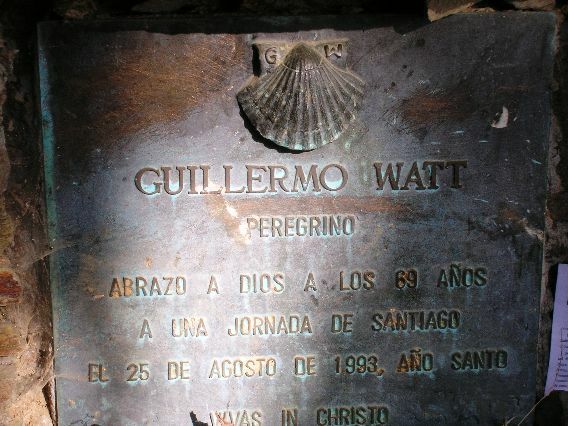 Zumsande Werner, a pilgrim who came from Saint Jean Pied de Port, died on May 24, 2005 in El Cebreiro (Lugo) after a heart attack. Jean Marchandy, French cyclist died on June 1, 2005 in Tiebas (Navarra) hit by a vehicle. Jose Manuel Llamazares Alvarez , 69 - Spanish pilgrim coming from Oviedo, died on July 1, 2005 in Santiago de Compostela after fulfilling his pilgrimage. PG, French pilgrim of 65 years walking with his wife, died on September 15, 2005 in the shelter of Astorga (León) after a heart attack. Ana Teresa Hernandez, Spanish pilgrim 19, died on September 18, 2005 in Gonzar (Lugo) due to arteriosclerosis. Joseph Carty – 78 year-old Irish pilgrim died just outside Ponferrada at the village of Campo. Franz Joseph Kokf, Belgian pilgrim 67, died on April 28, 2004 in Guendulaín (Navarra) of a heart attack. Bongardt W. Hubert , German cyclist pilgrim 66, died May 18 in the town of Moratinos (Palencia) - hit by a van. 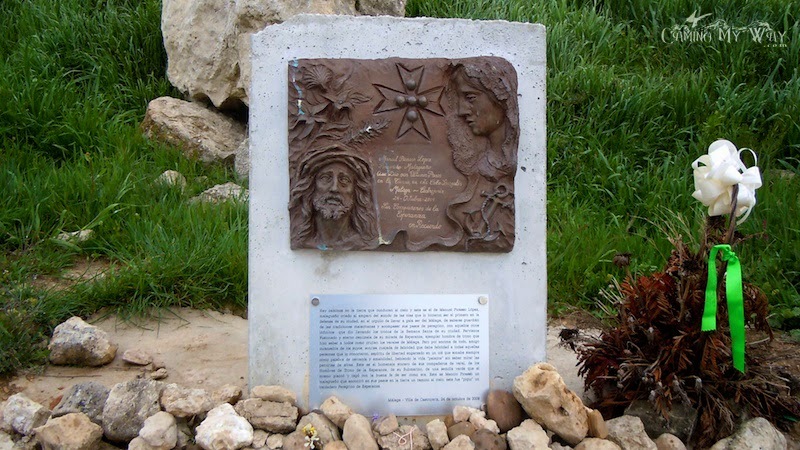 Surda Anton, Slovak pilgrim, died on May 22, 2004 in Legarda (Navarra) - hit by a car. Chápuli Alande Vicente , Valencia Pilgrim 35, died on July 24, 2004 in San Justo de la Vega (León) - hit by a vehicle. Barttolo Revelatto, Italian cyclist pilgrim 61, died on August 14, 2004 in Ponferrada (Leon) in his sleep at his hotel. Robert Edmond, Pilgrim 56, died on August 21, 2004 in Valverde de la Virgen (Leon) after a stroke. Luis Hoyos, pilgrim rider Villaba (Navarra), 24, died on August 23, 2004 in Mansilla de las Mulas (León) - run over by a van. Ramon Gonzalez de Mendoza Diego Villacé, pilgrim of Extremadura, died on April 21, 2004. Bernhard Stefan Jüttner, German pilgrim 63, died on September 12, 2004 in the shelter of Sahagún (León) in his sleep. An Italian Pilgrim with terminal cancer, died on Sept. 21 at the Cathedral of Santiago after fulfilling his pilgrimage. Francis J. Barte , French pilgrim and 59 Athos-Aspis, died March 5, 2003 near Valcarlos (Navarra). Lukassen , Dutch cyclist pilgrim, died on June 7, 2003 climbing to Cebreiro (Lugo). Gisele Boulard died 21 June between Calzadilla de los Hermanillos and Religos. 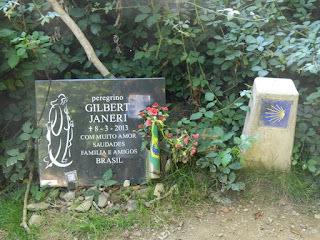 A Brazilian Peregrino , 48 years old, disappeared on January 13, 2002 in the Pyrenees and found dead on January 23, 2002 by two pilgrims. A French Pilgrim , 78 years old, disappeared on April 3, 2002 between Saint-Jean-Pied de Port and Roncesvalles and found dead a few days later by hikers near Ortzanzurieta (Navarra). Marie Catherine Kimpton, Canadian pilgrim, died on June 2, 2002 in Villatuerta (Navarra) hit by a car. Her husband was injured. 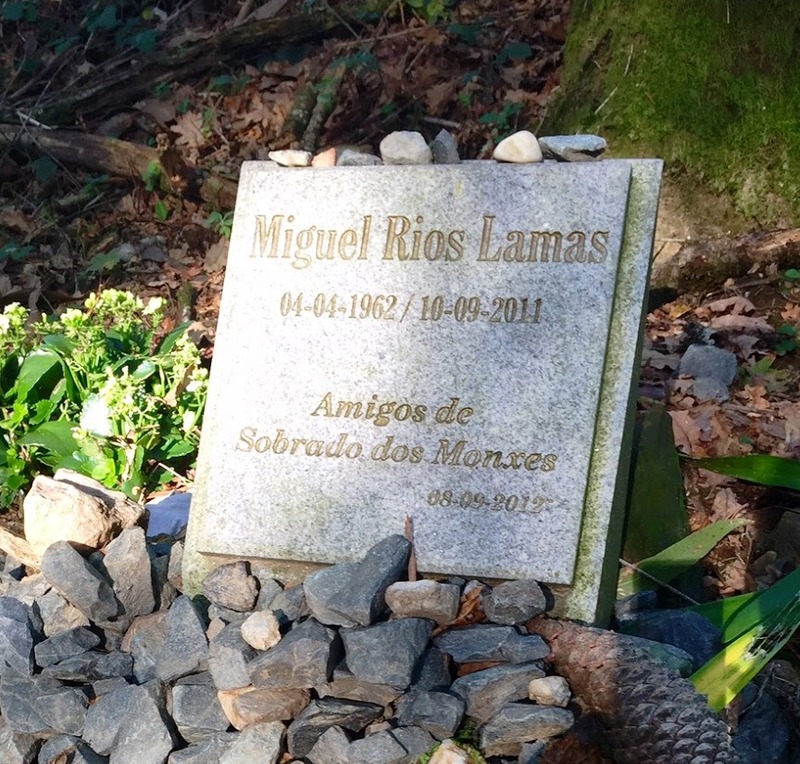 A French Pilgrim, walking with his wife, died June 4 in Sarria (Lugo). Klanke Ulbrich, German pilgrim 59, died on June 25, 2002. 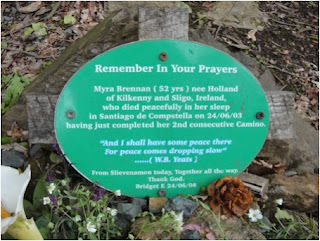 Braum Henrietta, German pilgrim who was struck by a vehicle on June 25, 2002 and died June 27 in Pamplona (Navarra). 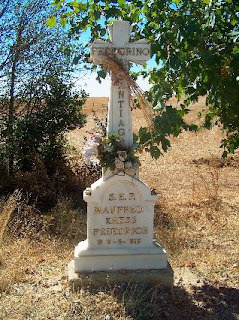 José María Huerta Otero, 25 pilgrim of Cadiz, died July 11, 2002 in the shelter of Rabanal del Camino (Leon) due to meningitis. 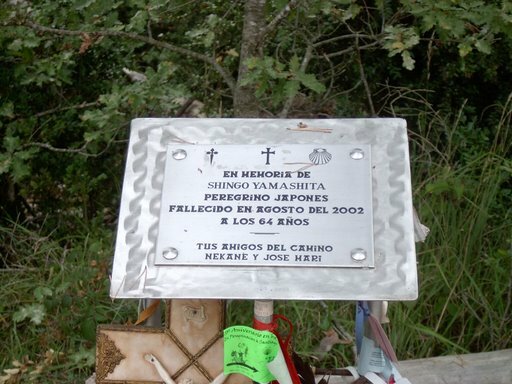 JRBF, pilgrim Lodosa (Navarra), 49, died on August 17, 2002 in the shelter of el Ganso (Leon). 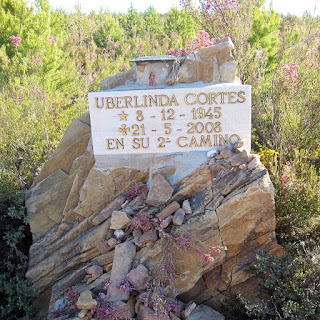 A Canadian peregrina, 49, died in 2002 at the hostel of Sarria (Lugo). Shingo Yamashita, a veteran Japanese pilgrim, 64-year-old was found dead on November 8, 2002 between Linzoaín and Zubiri (Navarra). Jouko Juhani Tyyri , Finnish pilgrim, died on May 9, 2001 at the pilgrim's hostel in Ponferrada (León) in his sleep. Francisco Juarez Arbeloa, from Leganes (Madrid), 59, died July 11, 2000 in Melide (La Coruna) of a heart attack. A Spanish Pilgrim cyclist from Sabadell (Barcelona), cyclist, died near Ponferrada (León) hit by a vehicle. Miguel Angel Rocino, born in Buenos Aires, died on 13-11-2000 aged 67. 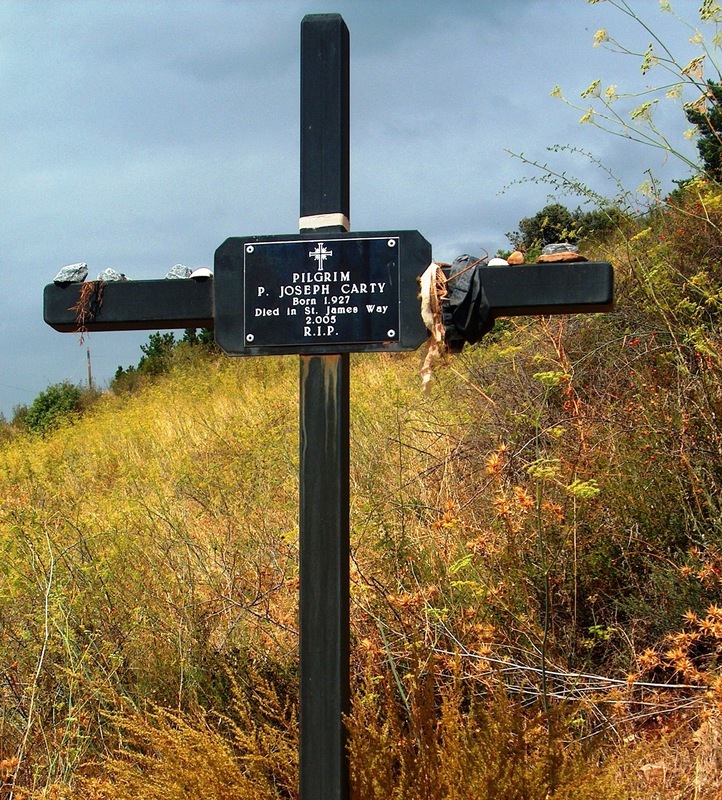 Libertad de Ramón , Enrique Lopez, Natividad Alonso and Carmen Navarro, bus pilgrims from the Diocese of Astorga, died on May 23, 1999 in a bus accident. 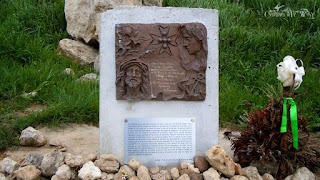 Emilio Muñoz Guerrero, a pilgrim from San Sebastian de los Reyes (Madrid), died on May 4, 1999 while climbing the Alto de Erro (Navara). Iñaki Esnal Murga , Spanish pilgrim who died on May 21, 1999 in Rabanal del Camino (Leon). Melendo Bernedi Sabin, a pilgrim from Bilbao, 62, died on June 5, 1999 in Leon at the start of his pilgrimage. Javier Mendez Biurrun, pilgrim of Tafalla (Navarra), died on June 22, 1999 at the hostel in Leon. G. Clifford Noylan, pilgrim American cyclist, died on July 9 on the N-120 at the entrance of Navarrete (La Rioja) - he was run over by a truck. Manfred Kress , German cyclist pilgrim 60, died on June 9, 1998 at Camino Real Bercianos (Leon). Paul Rolf Bäcker , Dutch cyclist pilgrim, died on June 14, 1996 in the hostel Melide (La Coruna) of a heart attack. in Sahagún (León) hit by a car while returning to his country. Jose Rodriguez Marcos, pilgrim rider 60 years, a native of Oviedo, died on July 25, 1995 between Palas de Rey and Monterroso (Lugo) following a heart attack. 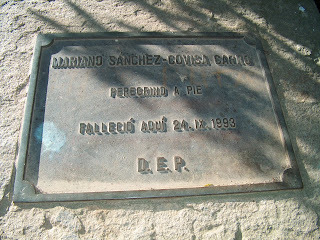 Mario Rafael Gonzalez , Spanish pilgrim, died on July 4, 1993 in Los Arcos (Navarre) hit by a vehicle. Guillermo Watt , Swiss pilgrim died on August 25, 1993 in Salceda (La Coruña). 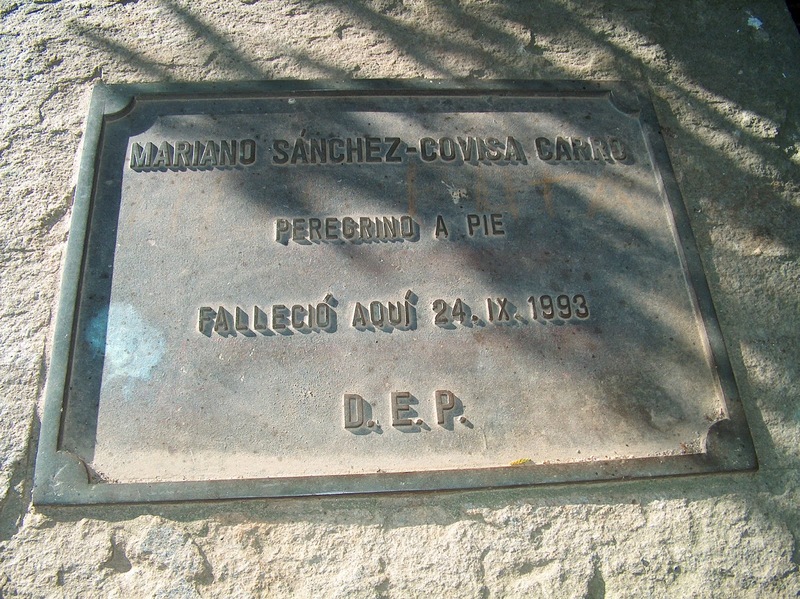 Mariano Sanchez Covisa Car , Spanish pilgrim, died on September 24, 1993 in Cerceda (Arca, La Coruña). Mariano Sanchez Covisa Carro, Spanish pilgrim, died on September 24, 1993 in Cerceda (Arca, La Coruña). Charles Prosper Remmy , Strasbourg French cyclist pilgrim, a priest of 56 years, died on August 17, 1989 in the village of La Granja (Sarria, Lugo) from cardiac arrest. Heinrich Krause , German cyclist pilgrim 26, died Aug. 31, 1987 in El Acebo (Leon) in accident on his bicycle. Alice de Craemer , pilgrim Belgian cyclist, died July 1, 1986 in Navarrete (La Rioja) hit by a vehicle whilst on pilgrimage with her ​​husband who was injured. Two memorials near the Virgin of Orisson. (1) presumably Dutch, no date Jean Paul voor altijd in ons hart Pa, Cora, Conny, Marcel (2) Balencie, Henry DCD 17/09/2009. Photos available. ©2007 Amawalker. All original writing and photographs on this website. Please ask for permission before using any part of this blog on your own blog or website and then include a credit or a link to this blog.